Task: to create guidelines for the design of flooring stores. 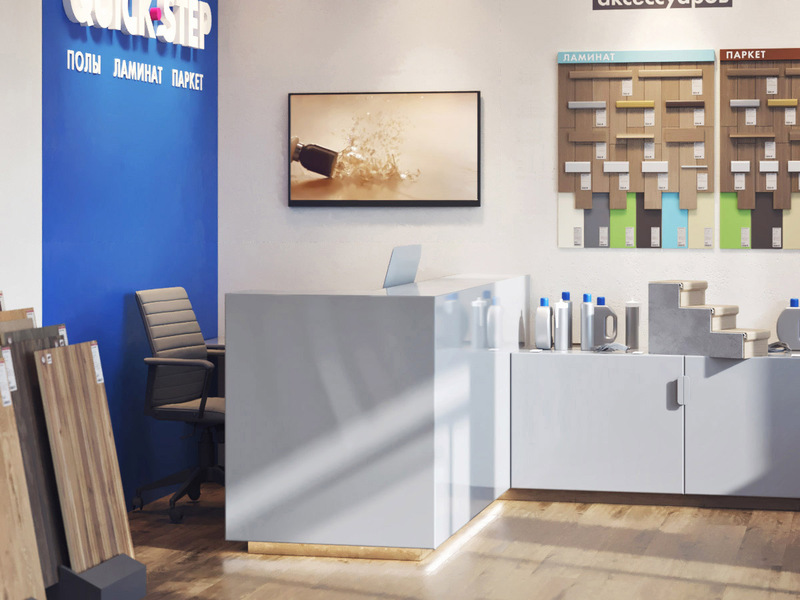 Quick Step, one of the largest producers of laminate, hardwood and vinyl flooring in the world, is opening a chain of stores in Russia. The studio helped the brand settle in the new region and attract buyers. First of all, we conducted full-scale research: we studied the unique features of the flooring market, found out what stereotypes about floors and flooring stores people have and figured out what to do with them. We took into account opinions of a broad audience including professionals and those who do renovations themselves. For some, price is of the greatest importance, others look at aesthetics and yet others are most concerned about the ease of installation. We developed a design for stores where people would simply like to be, inspiring them to explore everything from the sign at the entrance to the price tag. 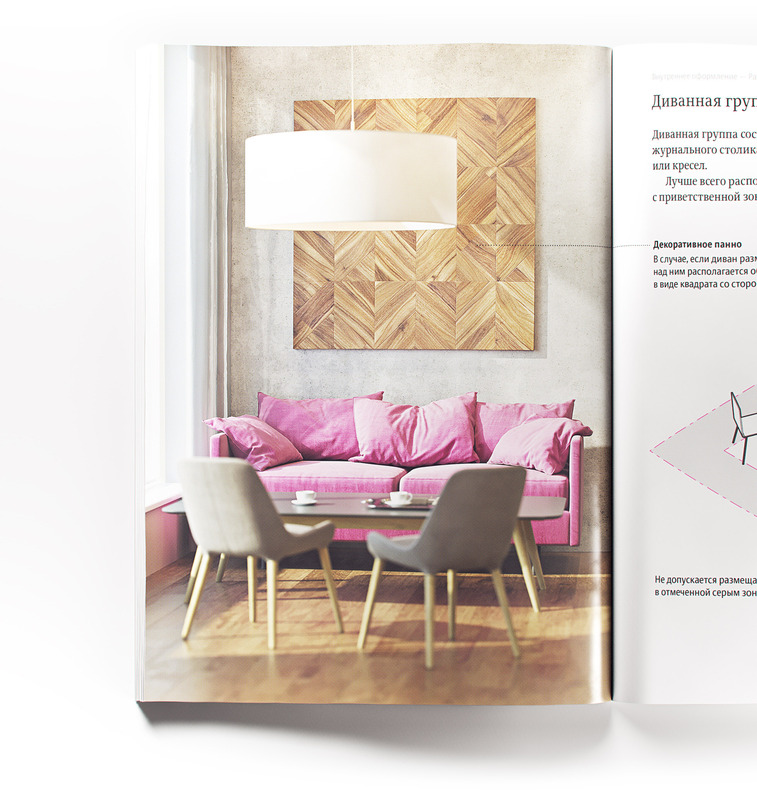 The principles for creating comfortable retail spaces were described in the multi-page document. 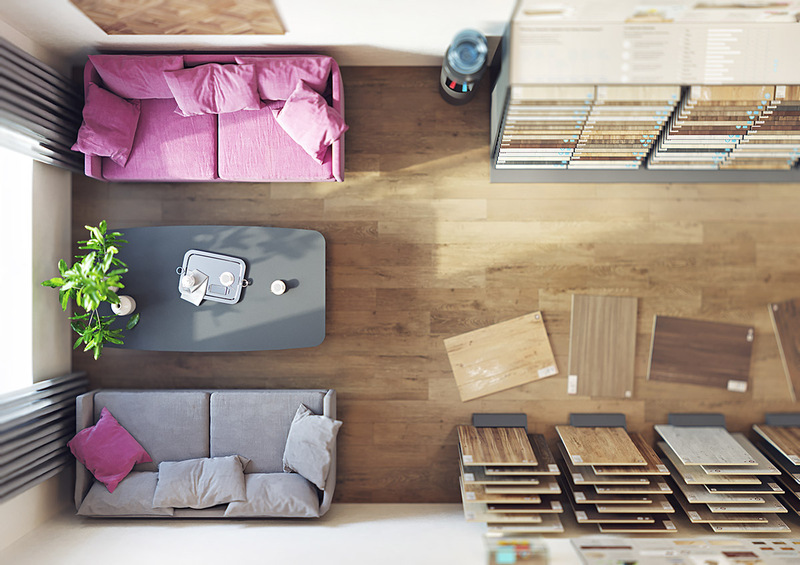 Regardless of the store’s square footage, choosing flooring in Quick Step is always comfortable. Samples are easy to look at, the space invites to be explored and it’s quiet and welcoming inside. We came up with a way to add product samples to the interior and blend bright inspiring accents with home comfort. 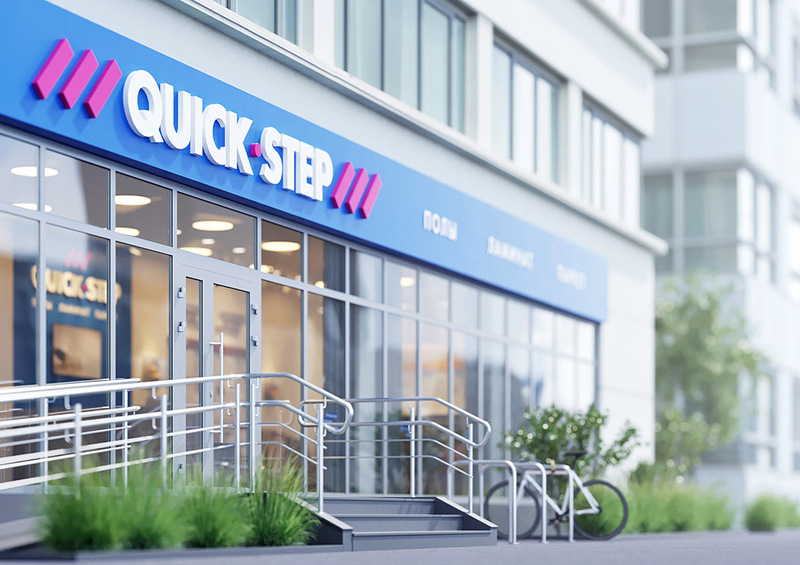 Quick Step stores have beautiful and memorable façades. Main types of products are listed right on the store sign. Every store is different. Universal rules help organize the space, choose finishing materials, place retail equipment and distribute elements of design. All interior solutions are pronouncedly laconic and do not distract the clients from the most important thing, Quick Step flooring. Retail furniture is easy to manufacture and care for. In the course of our research we also wanted to find out where people prefer to buy flooring, in specialized stores near their homes or in hypermarkets, and why. We came up with retail equipment setups for all possible use cases: for small and large stores, for placement in corners and along the walls. Detailed blueprints are given in the guide book. One of the key principles of space design is skillful embedding of promotional materials into the interior. We made advertising racks both beautiful and useful. Communication with customers takes place on several levels. 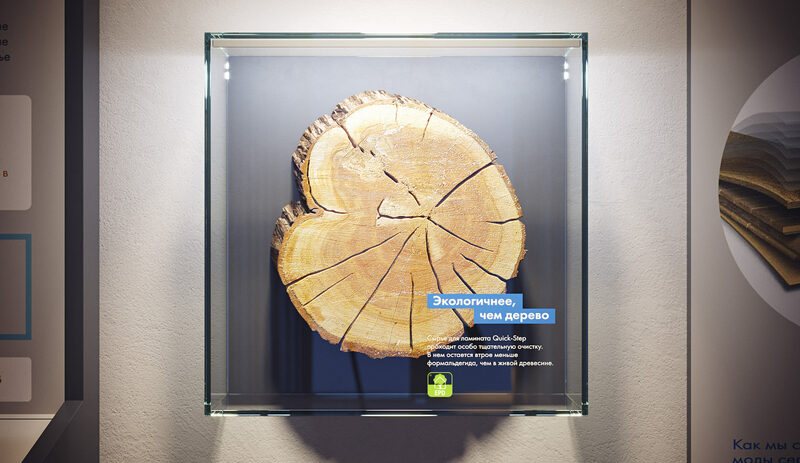 The graphics on the walls is visible from a distance and helps convey the core values of the brand. Trade equipment has a place for detailed information about products as well as navigation and auxiliary elements. To remove any possible doubts and questions that the clients may have, we analyzed the dominating stereotypes about laminate, hardwood and vinyl flooring. 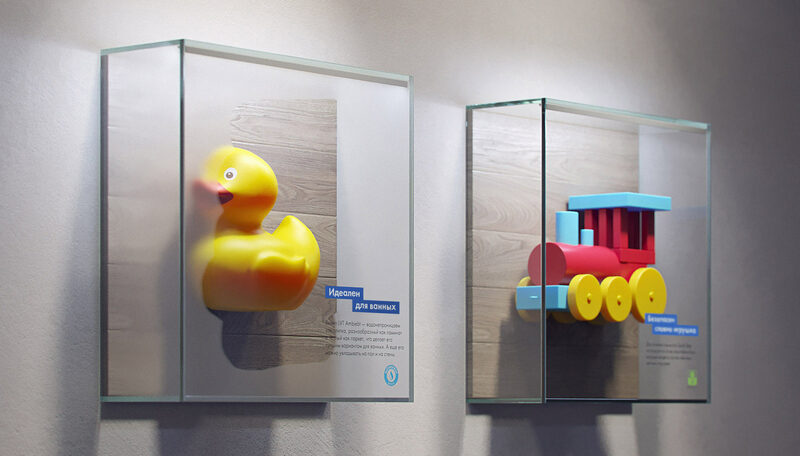 Clever art objects demonstrate special features of Quick Step floors. They attract attention and serve as effective advertising of the floors. When creating an image, every small thing is important. We carefully arranged the layout of price tags, placed pictograms of product properties and worked on many other things that are normally ignored.